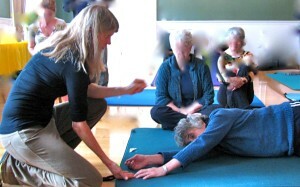 I began studying the Feldenkrais Method® in 1984, after seeking every possible treatment (Osteopathic, Physical Therapy, Chiropractic, various Massage therapies, Rolfing, Cranial Sacral, Acupuncture, etc.) for chronic, debilitating knee pain. I couldn’t walk, hike, bike or swim without pain. In one lesson, I experienced a profound shift in the alignment and coordination of my legs with my entire body. While it took me a while to shift the pattern causing this pain, over the three decades in studying this Method, I continue to refine the ease in my movement and life. This was the beginning of my career in bodywork and awareness study. I use this method (along with Nature Awareness) to help expand awareness to move past obstacles in learning, healing, performance and problem-solving. 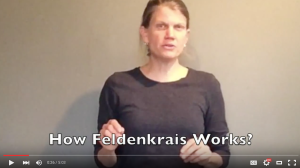 The Feldenkrais Method® named after its founder, Moshe Feldenkrais, is a sensory method of learning to refine one’s movement, improve function and expand awareness. 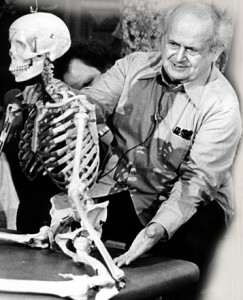 Feldenkrais developed his method in the mid-1940s after suffering a crippling knee injury. He found he could teach himself (and others) to align, stabilize and move better based on the neuroplasticity of the brain for learning to function better. Through guided positions and movement with self-awareness, a student engages their senses to refine their ease in an activity. People develop expanded awareness to find better choices for movement, action and life. For a short 5 minute demonstration on these three principles, try this Youtube lesson below.